There are several things that have been rattling around in my head lately and I have decided to post some of them. First of all, have you wondered just what the Lord expects from us all? Read Micah 6:8 (my wording) "God has showed you, O man, what is good and what the Lord requires of you: to do justly and to love mercy, and to walk humbly with your God." And when Jesus left this earth, He told us in Mark 16:15, "Go ye into all the world, and preach the gospel to every creature. He that believeth and is baptized shall be saved; but he that believeth not shall be damned. and these signs shall follow them that believe; in My name shall they cast out devils; they shall speak with new tongues; they shall take up serpents; and if they drink any deadly thing, it shall not hurt them; they shall lay hands on the sick, and they shall recover." Now, don't get me wrong, I don't believe in serpent handling to prove how holy you are. That is 'presumption' and that is wrong. Jesus was referring to what happened to Paul when he was on the beach building a fire. A viper bit him and he threw it away. He should have died from the bite but he was protected by the Lord. It was a great witness to the unbelievers with him. And because of the other signs that followed him, they believed on the Lord Jesus Christ also. Signs follow us, we don't serve the Lord because of the signs and wonders. We don't chase the signs and wonders. I do believe that when we bless our food, it is blessed and we rest in that. In this day and age, we are told not to eat eggs because of cholesterol. We can't eat red meat because of mad cow disease and cholesterol. We can't eat chicken because of bird flu. We can't eat turkey because of the same things. E-coli, salmonella, diseases, etc. So, no meat. But the vegetables are just as bad. The tomato scare just recently is case in point. Even the water supply is tainted. We are overpopulated and our nation is in trouble. It's going to get worst, not better. We bless our food, and worship our God, and we will not be harmed. It is going to become clearer and sharper as time goes on. Christianity will be shunned and even become against the law, but we will be healthy and prosperous. Just like the Jews of old. It will be like the difference between light and dark. The world is going to say, "Why aren't you sick like us? What is the difference?" And it will be an open door for us to witness to the Love of Jesus Christ. In other words, we are to be Jesus to the world. What did Jesus say His commission was? Luke 4:18-19 (NKJV) "The Spirit of the Lord is upon Me, because He has anointed Me to preach the gospel to the poor; He has sent Me to heal the brokenhearted, to proclaim liberty to the captives and recovery of sight to the blind. To set at liberty those who are are oppressed; to proclaim the acceptable year of the Lord." This was what He read in Isaiah 61:1-3, "The Spirit of the Lord GOD is upon Me, because the Lord has anointed Me to preach good tidings to the poor; He has sent Me to heal the brokenhearted, to proclaim liberty to the captives, and the opening of the prison to those who are bound; to proclaim the acceptable year of the Lord, and the day of vengeance of our God; to comfort all who mourn, to console those who mourn in Zion, to give them beauty of ashes, the oil of joy for mourning, the garment of praise for the spirit of heaviness; that they may be called trees of righteousness, the planting of the Lord, that He may be glorified." Why do we make it so complicated? Our lives should portray our faith in Christ without any extra effort. Now here's my question: If being a Christian were against the law, would there be enough evidence to convict you? Because when it gets difficult, and it will get difficult, will you turn away also? When they say that it is wrong to stand against homosexuality (oops, it already is) will you stand with God and say that it is an abomination? Or will you agree with them? When they say that you are narrow minded, will you change your point of view. When public opinion says that Christianity should be outlawed because it causes too many people 'distress' instead of love, what will you say? This is already happening, folks. And it is going to get worst. When the government 'suggests' that we need to go to a New World Church, or whatever they choose to call it, what will you do? Will you join with the others by believing, "Oh, well, it's not that big a thing, I don't want to cause trouble." John 6:66-67 (NKJV) "From that time many of His disciples went back and walked with Him no more. Then Jesus said to the twelve, 'Do you also want to go away?' "
Then Peter said these words, "But Simon Peter answered Him, 'Lord, to whom shall we go? You have the words of eternal life. Also we have come to believe and know that You are the Christ, the Son of the living God.' " John 6:68-69 We have to remember that it is all about Christ, not us. We need to stand firm. Stand and know that Jesus is God. Wait on Him. If you are like me, finding time to just sit and read the Word can be quite a challenge. While working the fairs (and other times) I use what I call "Scripture Snacks". I buy 3" x 5" index cards that have a spiral binding on the top. You can find them anywhere they sell office/school supplies. They cost around $1.00. Then, when I am reading and a find a scripture that really speaks to me and I want to remember it, I write it on one of the 3x5 cards with the reference. They are small enough to carry around in my purse and when I have some spare minutes, I will take them out and read one. It's like having a different scripture everyday like on the calendars. I find that the Lord always has one show up that I need for that day to encourage me or lift me up. It keeps my spirit fed with the Word. Deuteronomy 8:3 (KJV) "And He humbled thee, and suffered the to hunger, and fed thee with manna, which thou knewest not, neither did thy fathers know. That He might make thee know that man doth not live by bread only, but by every word that proceedeth out of the mouth of the LORD doth man live." Well, here it is again, fair season. 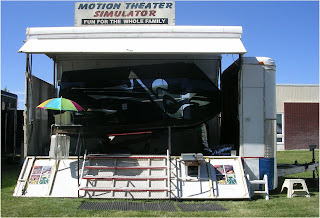 We will be doing 5 state fairs with the simulator from now until the latter part of October. I will try my best to do some blogging while we are on the road, but please forgive me if it is not too regular. So, if you see us anywhere you can come by and say, "Hi!"